Two guys get lost in the desert and try to find their way out. 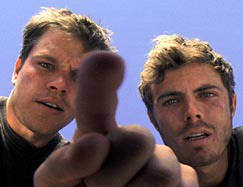 Apart from that the flicks premise, is a drama about two guys (Damon, Affleck) who call each other "Gerry" stranded in the desert during a hiking expedition, and that they suffer dehydration (not a huge surprise). "If you're trying to give me the finger... gotta tell you, I've seen better."